If any of you folks have been keeping up with our Homepage, chances are that you would have probably read my article about PoWiFi, a new form of technology that can transfer small bits of electricity over WiFi. Now I don't know about you guys, but after I learned about that, I really couldn't think of any other new innovation that could drastically improve the concept of WiFi, but lo and behold, here we are yet again with a new invention that promises to change the way we access the internet. Meet Li-Fi, a new form of technology that promises to deliver internet to our devices at speeds that are up to 100 times faster than traditional Wi-Fi. 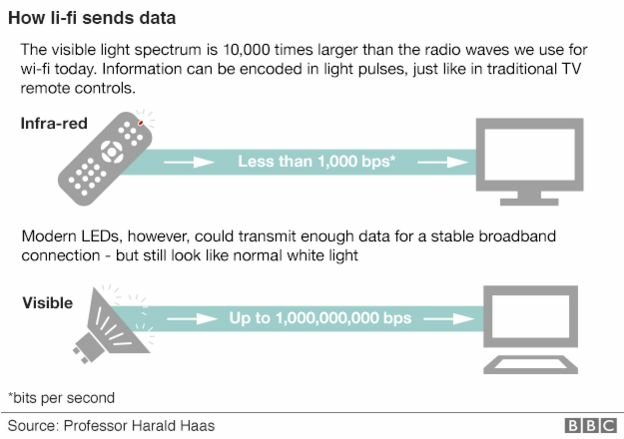 As you may have already noticed, the technology has already been named Li-Fi, presumably to coincide with the idea of "light-speed" and light in general. Now speaking of light, a light source is required to utilize Li-Fi because believe it or not, the technology requires a light bulb to function. Along with a light bulb, you will obviously need an existing internet connection and a photo detector. Other than all of that, it works essentially the same way that Wi-Fi does but instead, it uses beams of light to carry the internet signal. This will be explained in the short info-graphic below. So as you now know, it uses light bulbs to transmit signals. This offers faster speeds, but one downside would have to be the fact that it's limited to exactly how light works. This means that Li-Fi cannot penetrate walls since light cannot go through walls, and Li-Fi cannot work outdoors under sunlight. This is arguably the biggest downside as of now so Li-Fi is not all that practical in every scenario that Wi-Fi currently is. One advantage it does have, however, is that Li-Fi doesn't interfere with other radio signals transmitted from other devices, so this technology could easily be used on somewhere like a plane for instance. The man behind all of this, Professor Harald Haas from Edinburgh University, first demonstrated this technology during a TED Talks segment back in 2011. A video of the segment can be found below. Now in terms of the speeds, it has been claimed that this new technology could be about 100 times faster than Wi-Fi. Through another demonstration last week, a LED bulb was able to transmit speeds at up to around 1GB per second but further studies have shown that it is possible to get up to around 224GB per second which is absolutely astonishing. No release date has been coined as of now, but this technology is certainly something to follow and to keep up to date with. What do you think? Would you invest into something like this? Leave your thoughts below! Pyroman, NikkiBear, Bup The God and 14 others like this.